An experiment in interactive lawmaking is bearing fruit, a pair of senators say. Candid comments have streamed in to the Web site that Sen. Joseph I. Lieberman (D-Conn.) and Sen. Fred Thompson (R-Tenn.) launched in May. The pair created the site to get the public's input on federal electronic-government initiatives. Sens. 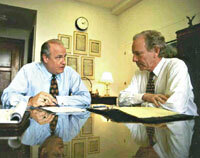 Fred Thompson, left, and Joseph Lieberman say they will use site responses to draft e-government legislation. The responses so far have touched on multiple topics, from citizens' Internet access and interagency funding for information technology projects to public-private e-government partnerships and federal work force literacy. Thompson, chairman of the Senate Governmental Affairs Committee, and Lieberman, the committee's ranking Democrat, said they hope that the responses will help them pen effective e-government legislation. Visitors to the site have ranged from federal systems personnel to a hearing-impaired woman interested in Internet access for the disabled. The site also has received several anonymous postings. The site also has garnered a slew of opinions about the establishment of a governmentwide chief information officer, a proposal that is currently a hot topic among Washington's power brokers. One post said resistance to a governmentwide CIO seems to be based on avoiding failure'after all no one official can solve all the problems the government faces. 'Rather than add a central CIO focus to our existing government agency structure, the federal government needs a central product and service focus,' said a post from a Financial Management Service official. Lieberman said he's pleased with the site. Interaction between the government and public will lead to a smart e-government agenda and the enactment of well-thought-out legislation, he said this month at the e-Gov conference in Washington.  There is a need for effective leadership of governmentwide IT issues. Lieberman supports the establishment of governmentwide CIO and giving this IT czar authority to lead and coordinate interagency projects.  The government needs to integrate service delivery. E-government initiatives should streamline the process of delivering federal services to citizens'not simply digitize old forms and business practices. There must be no confusion regarding overlap of agency jurisdictions.  The government's systems lack interoperability. The government needs to establish standards that make sharing data possible across all agencies and use interoperability to provide integrated services.  Interagency funding would promote cooperation. Agencies and Congress must improve the appropriations process and fund more interagency systems projects that ultimately would reduce expenditures on redundant services. The government also must eliminate its stovepipe systems.  There is a need for urgency. Government insiders realize that agencies cannot fall behind. Even so, they need to educate themselves through interactions with the private sector and citizens. The government has not been idle in these areas, Lieberman said. Its creation of the CIO Council, the National Partnership for Reinventing Government and the upcoming governmentwide Web portal, FirstGov, are steps in the right direction, he said. e-Government: An Experiment in Interactive Legislation, is at cct.georgetown.edu/development/eGov.